A very quick and simple recipe that requires minimal ingredients, this pulao is an option when you get bored with your normal rice or tiffin. The pulao is mildly flavoured with few whole spices and the sweet yet crunchy green peas. Green peas is something so commonly used in our cooking that we normally don't think much of it in terms of nutritional value. So the below table from WHFoods would be quite an eye opener for a lot of us! I always keep a pack of frozen green peas as it is a very handy ingredient; takes little time to cook and also imparts colour and flavour to any dish. While fresh is always best, frozen foods like green peas and berries are always handy. They stay good for a longer period of time and I have even come across some articles which mention studies that claim frozen foods have more nutritive value than fresh! This is probably due to the fact that such foods are harvested right at their prime and immediately preserved which keeps all the vitamins intact. While buying fresh peas, always look for bright green, crisp and firm pods. Smaller peas tend to be sweeter. You can either enjoy this pulao as a simple meal with raita and pickle of your choice or serve it along with a tangy, spicy curry. If you are using frozen green peas, cook it in the microwave for about 3 minutes, in very little water. Drain and set aside. Heat ghee in a deep vessel and add the the cumin seeds. As the seeds splutter, fry the whole spices for few seconds, followed by the finely chopped onions. 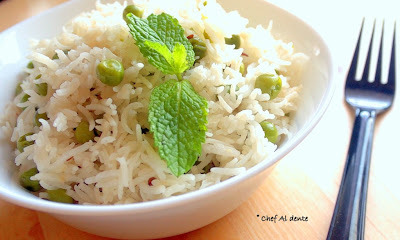 When the onions turn translucent, add the green peas and the basmati rice. Fry it gently for few seconds. Then add the 2 cups of water and season with salt. Cover the vessel with a lid and cook till the water has been absorbed and the rice is well cooked. Serve hot. Love this. looks falvourful and delicious. One of my favorite pilafs, nicely presented..